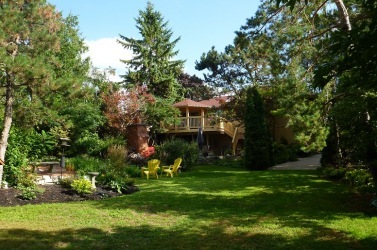 here's your 1/4 acre "cottage country" escape right here in town. peaceful whispering pines! babbling brook w/fish stocked pond! huge outdoor patio w/brick fpl. truly a "1 of-a-kind" gem! oversized mbr retreat w/4 huge dbl closets, a 5 pc-ens w/sep shower & a star gazing soaker tub sky-lite! and a private mbr gazebo!! this customized floor plan is a downsizers delight or a young couples dream! custom open concept chef's kit w/spacious counters, sky-lite! lrg breakfast bar! dining rm w/o to entertaining sized porch & deck w/treed roof-top sun-set views!! a lifestyle delight!! 7 min drive to box stores & hwy 400! please include sch b, form 801. min 5% certified dep. this bright, dreamy custom bungalow is so much more than just bricks & mortar! !